Carl is a professional Pattern maker! 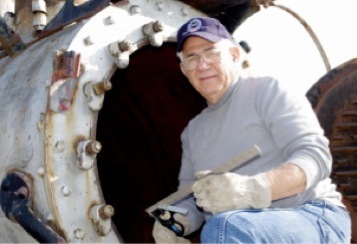 He brings 45+ years of experience to the shop in both the ship and airframe industries. When we need a part to be cast through the process of a poured hot metal molding, Carl is the man that creates the wooden patterns (models) from either original engineering drawing or by creating a new pattern from an original cast part. Carl is one of a dying breed of talented men still able to reverse engineer and to measure with special rulers and calipers. If we had to replace Carl with a computer program, we wouldn’t be able to afford it, and right now we can’t afford to lose Carl. 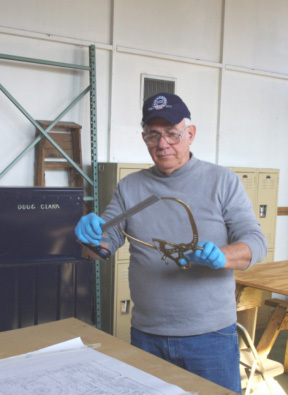 Carl’s satisfaction as a volunteer comes from being able to create a pattern that ultimately becomes a part of the Denver and Rio Grande’s steam engine #223’s restoration. Carl has had no relatives who worked on a railroad, but he can now add trains to his experience with ships and planes.